The 19th edition of Skopje Fashion Weekend, the main fashion event in North Macedonia, took place from March 29 - 31. What made this edition special, is the co-operation with United Fashion, a project funded by Creative Europe. Thanks to this collaboration, the organisation has put together an international program with mainly young and emerging labels. In particular, there were many designers from the South East Europe and Ex-Yugoslavian region such as the promising talent Marko Feher from Bosnia and Herzegovina. We were happy to meet with former FASHIONCLASH Festival participant Marija Kulušić(Croatia), Andra Handaric(Romania), Ece Özalp(Turkey) and One Wolf(Latvia) again. The program contained fashion shows, a showroom and an exhibition by Ivan Asen 22 - avant-garde fashion collective from Bulgaria. The core of the 19th edition was the United Fashion SEE Showroom. Skopje Fashion Weekend took this opportunity and gathered designers and professionals from across Europe, making the short trip to Skopje worth the effort. Unit­ed Fash­ion is car­ried out by a clus­ter of Euro­pean fash­ion sup­port asso­ci­a­tions MAD Brussels (BE), Flanders DC (BE), ModaLisboa (PT), Baltic Fashion Federation (LV), Maison de Mode (FR), Fashion Weekend Skopje (MK), Fashion Council Germany (DE) and Not Just A Label (UK). The aim of the project is to enhanc­e the cul­ture of fash­ion design­ers across Europe to be more busi­ness mind­ed and at enhanc­ing their com­pet­i­tive­ness inter­na­tion­al­ly, with­out lim­it­ing their creativity. Unit­ed Fash­ion received the sup­port from the Cre­ative Europe pro­gramme of the Euro­pean Union. Through a num­ber of inter­na­tion­al net­work events and trans­dis­ci­pli­nary train­ing work­shops, over a four-year peri­od, more than 150 fash­ion design­ers will have the oppor­tu­ni­ty to par­tic­i­pate by show­cas­ing their col­lec­tion, get­ting to know and under­standing sev­er­al Euro­pean mar­kets, devel­op­ing new skills in fash­ion tech, sus­tain­able fash­ion, pro­duc­tion, craftsmanship, and business models. 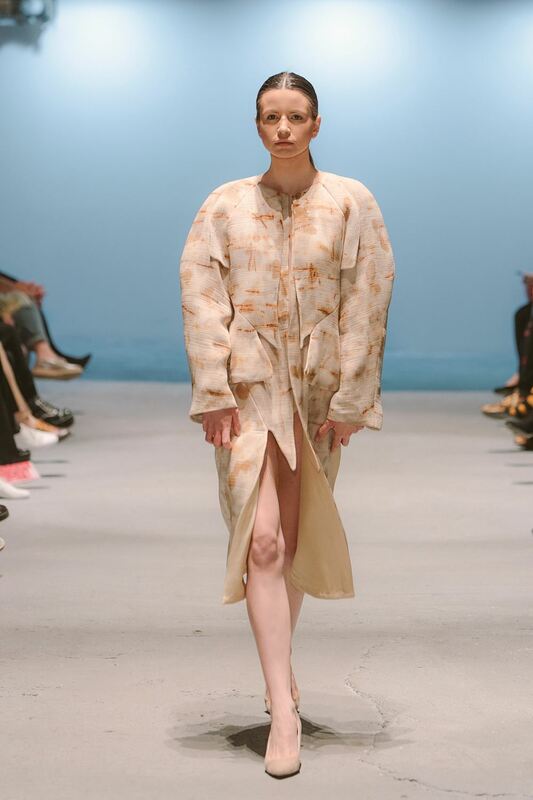 As members of the international association that is implementing the ‘United Fashion’ project, organizers of this year’s 19th edition of Fashion Weekend Skopje welcomed twenty-nine emerging labels from all over Europe. The main goal of the ‘United Fashion SEE Showroom’project in Skopje was to promote fashion designers from Southeastern Europe (SEE) to international buyers and media representatives, as well as to connect designers from the European Union with Macedonian factories. For this purpose, activities included presentation of the SEE market by professionals in the industry, presentations from selected local manufacturers, visit to the factories and meetings between participating designers and local producers.